Every Friday I’ll be reviewing two books, usually comic books, graphic novels, manga and the like, though I promise to crack open my eReader at some point. Actually, that doesn’t really sound like a good idea … hmm. Anyway, today I’ll be talking about two titles from IDW and my own comic book collection passion, Star Trek. The first is the first draft of a classic Original series episode, and the second sends our intrepid voyagers from the Abrahms-verse into the DS9-y future, all with the ‘help’ of Q.
Let’s start with the positives on this one. The artwork is superb, particularly the faux retro covers for each issue. Those creases on the cover give this feeling of something that has been read and loved many times since you bought it all those years ago. The interior painted artwork (or at least Photoshopped to look like painting) is classy, detailed and expressive. Especially cool were some of the far away shots of the abandoned city, and the coloring choices on a pivotal conversation between Kirk and Spock over Kirk’s falling in love with a woman who has to die. 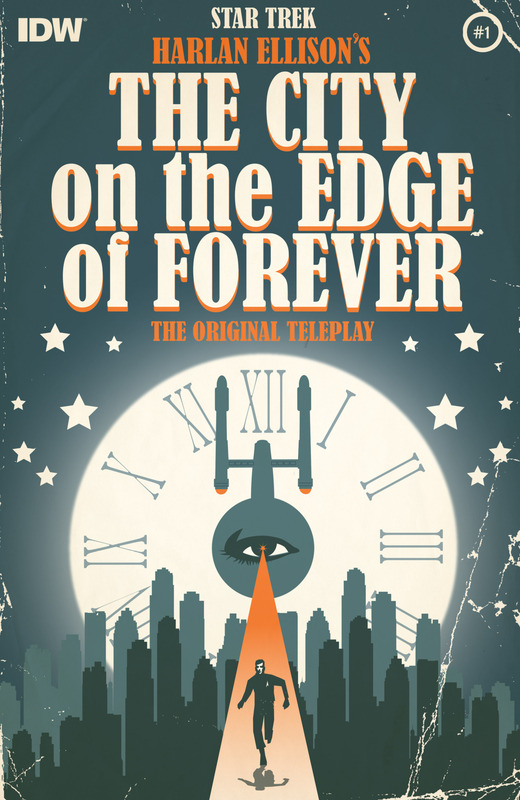 The basic plot of this story is similar to one on television, one of Kirk’s crew goes into the past and changes an event that erases their future, and Kirk and Spock must go back in time to restore the timeline. As it turns out a woman named Edith Keeler is the pivotal moment. If she lives, she’ll start a peace movement that delays the United States entering World War Two, allowing the Nazi’s to conquer the world. If she dies, the future plays out as it should, therefore she has to die with the complication that Kirk is falling in love with her. Beyond that, this has none of the charm of the original. Some elements, like the actual physical guardians and ruined city, and a crew member selling drugs on the Enterprise, are fine, even if these had raised practical or moral concerns back in the 60’s. But where Ellison’s rendition really falls apart is his complete misunderstanding of Spock. Ellison’s Spock is shocked and disdainful (at times visibly) of the barbarism of Earth’s past, yet is willing to resort to force when he’s been cheated out of money for his work. Kirk isn’t much better, remarking at one point that he should have left Spock to an angry racist mob. Kirk is moody, prone to clutching Edith in tears at a slight kindness, and is weary of the Captain’s chair. And then there’s just the dippy bits. Whether it’s actually using the line “like a city on the edge of forever” in dialog, or the mysterious riddle left by guardian meant to point the way to the focal point (“Blue it will be. Blue as the sky of old Earth and clear as truth. And the sun will burn on it, and there is the key.”). Here’s the riddle’s solution (*spoilers*) Edith is wearing a blue cape, held up by a sun pin, she’s speaking truth and her name is … wait for it … Key-ler. *ugh* This is why writers need editors. This was an Ellison darling he really should have let go. It’s an interesting case study, if nothing else, and ironically it won a Hugo, but if I were you, I’d stick to the true original. Note: This story takes place a few months after Star Trek Into Darkness as well as the events depicted in IDW’s Star Trek Countdown (which served as a lead-up to the first J. J. Abrahms movie). You may want to refer to both before reading this book, though everything’s pretty much explained. Q appears to Picard (now ambassador to Vulcan) and explains that while Spock’s actions to stop Nero saved their time-line, it may have adversely affected the time-line in the other (Abrahms) time-line (see Star Trek (2009) and Star Trek Countdown). Picard attempts to dissuade Q from mucking about in other universes but to no avail. Q then throws Kirk (Chris Pine version) into a literal Kobayashi Maru test as a preface to explaining to Kirk that there is such a thing as a no-win scenario, something Kirk adamantly refuses to believe (given he just cheated death against Kahn). To prove him wrong, Q throws Kirk and crew 100 years into the future (DS9 era). The Dominion and the Cardassians have defeated the Federation, and the Klingon Empire has seized control of Earth by force, rather than let if fall to the Dominion. The Enterprise is quickly disabled by Dominion ships and the crew is brought about Terok Nor, commanded by Gul Dukat. Where Ellison fails to capture Spock, Johnson writes Dukat perfectly, capturing the charm and ruthlessness that made him one of the most enjoyable villains in DS9. The Dominion may have their plans for taking over Earth, but Dukat has his own plans for rising to God-hood. Every chapter of this tale shows us a new take on familiar characters, whether it’s Keiko in charge of the Defiant, Kira as a renegade trying to decipher a tablet that holds the last prophet, Sisko as loyal subject of the Klingon Empire and Federation rebel, and Worf as chancellor of Earth. Q’s motives are of course not as they seem, and he may need Kirk’s belief that there is no-win scenario before this tale is over. Likenesses are spot-on, though the scar on Dukat’s face is occasionally visually distracting. Alternative character designs, particularly Bashir in goggles are fun, and the station and ship details are spot on. My only complaint is that Q does little except taunt the crew beyond the first chapter, and only plays a pivotal role at the end. That said, his scenes at the end are equal parts amusing and thrilling. This is a great tie-in to fans of the new movies and especially DS9 and Q. DS9 hasn’t always gotten the best treatment in comic books, and it’s great to see it written so well here.